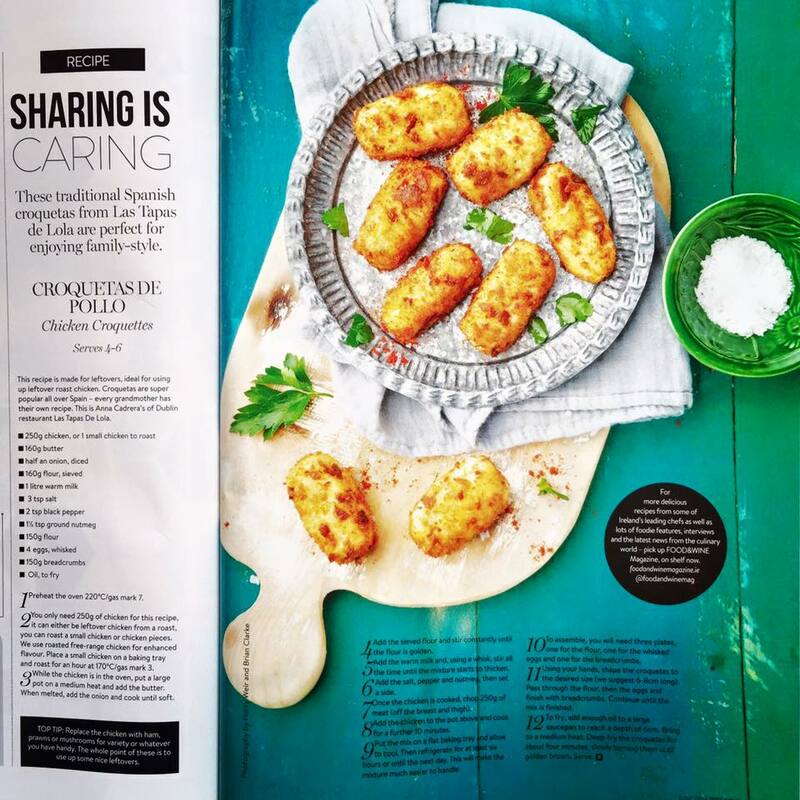 We were delighted to see our croqueta recipe making an appearance in Irish Tatler Magazine's June edition. It's certainly proven to be a popular recipe amongst readers. Try it out! Check out below! Only 250gr of chicken required – we use roasted free-range chicken for enhanced flavor. So place a small chicken on a baking tray and roast for an hour at 170C. While the chicken is in the oven; put a large pot on a medium heat; add the butter. When melted, add the onion and cook until soft. Add the sieved flour and stir constantly until the flour is golden. Add “warm” milk and with a whisk stir all the time until the mixture starts to thicken. Add the salt, pepper and nutmeg, then set a side. Once the chicken is cooked, chop 250gr of meat (off the breast and thigh). Add the chicken to the pot above and cook for a further 10 minutes. Put the mix on a flat baking tray and let to cool. Then refrigerate for at least 6 hours (or until the next day). 3 plates – one for the flour; one for the whisked eggs; and one for the breadcrumbs. Using your hands, shape the croquetas to desired size (we suggest 6-8cm long). Pass through the flour, then the eggs and finish with breadcrumbs. Continue until the mix is finished. Add enough oil to a large saucepan to reach a depth of 6cm. Bring to a medium heat. Deep-fry the croquetas, slowly turning them until golden brown. Tip: Replace the chicken with ham, prawns or mushrooms for variety.